Vicki Girard was diagnosed with stage 4 breast cancer. Her bone scan lit up like a Christmas tree. Her doctors said “Get your affairs in order.” Vicki underwent bone marrow transplant while making some major changes in her diet and attitude in 1994. Her cancer disappeared. Eleven years later, with usually good quality of life, Vicki succumbed to her disease. But not before writing her classic book NO PLACE LIKE HOPE. Survivors of breast cancer include former first lady, Betty Ford; the matriarch of women’s liberation, Gloria Steinem; singer celebrity, Olivia Newton-John; U.S. Supreme Court Justice, Sandra Day O’Connor; and master chef, Julia Child. In 1960, one out of 20 American women, or 5%, could expect to develop breast cancer in her lifetime. Today that number has risen to one in eight, or 12%, a 250% increase in the incidence. This year, over 180,000 Americans will develop breast cancer, of which 1,400 are men, with 46,000 deaths expected. After lung cancer, breast cancer is the second most prevalent cancer in the United States. 42% of Americans will get it. One in four will die from it, with nearly 600,000 mortalities expected this year. In the near future, cancer will surpass heart disease as the number one cause of death in America. It is already the number one fear. Researchers have been busy trying to find a “magic bullet” cure for cancer, unfortunately with little success. The National Cancer Institute was formed in 1971 when President Nixon confidently declared that we would have a cure by the bicentennial of 1976. By 1991, the 20th anniversary of the “war on cancer”, a group of highly respected physicians and scientists gathered a press conference to report that “our ability to treat and cure most cancers has not materially improved.” Essentially, the $45 billion 30 year war on cancer has been a serious disappointment and we must rethink our strategy. What are the solutions to our health care debacle. No one with a headache is suffering from a deficiency of aspirin. And no one with breast cancer has a deficiency of chemotherapy or tamoxifen. While chemo, radiation, and surgery can eliminate a few trillion cancer cells, these dramatic invasive therapies do nothing to change the underlying cause of cancer. Each day, our cells are dividing to replace lost cells and rebuild damaged tissue. We grow from a fertilized egg in our mother’s uterus to a 60 trillion-celled adult through trillions of cell divisions. Each of these divisions carries the potential of making a mistake in the body’s “blueprints”, or the DNA, which could then give birth to an abnormal cancer cell that grows too fast and eventually overwhelms the body through malnutrition, infection, or organ failure. According to the experts, the average adult generates 6 cancers in a lifetime, but a healthy immune system is able to recognize and destroy these saboteurs from within. In the cancer patient, this elegant control mechanism has failed. Beating breast cancer involves restoring the internal control systems that allow us to find and kill cancer cells. Nutrition is crucial in this quest. Fungus grows on the bark of a tree due to the conditions of heat, moisture and darkness. You can “cut, burn, and poison” all you want on that fungus, but more fungus grows as long as the favorable conditions for fungus growth are present. Similarly, cancer grows in a person due to the conditions of high sugar, immune suppression, toxin overload, abnormal pH, maldigestion, parasites, allergies, hypothyroidism, psychological stress, malnutrition and more. You can cut (surgery), burn (radiation), and poison (chemotherapy) all you want on the cancer, but as long as these underlying conditions are present, the cancer continues to grow. While chemo, radiation, and surgery do reduce tumor burden and provide many a patient with a head start, cancer can only be beaten when the conditions that started the disease are changed. There are many nutrients in food and supplements that allow the body to both prevent and reverse cancer. 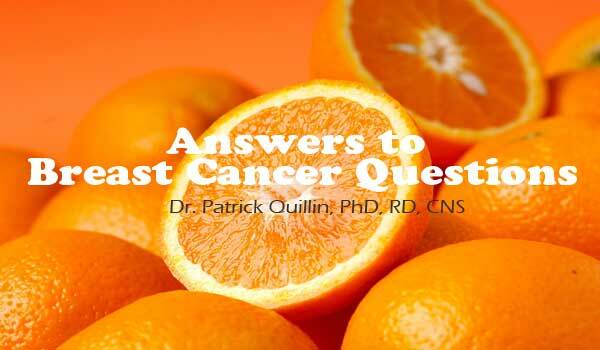 There is a straight line relationship between fat in the diet and incidence of breast cancer. People who eat a low fat diet, such as the Japanese, Seventh Day Adventist, and Mormons, have one half to one fifth the breast cancer incidence of the normal American. We need to cut our fat intake from 40% of calories down to a healthier 20-30% of calories, by eating less beef, dairy, margarine, and fried foods, while increasing our intake of whole grains and legumes, vegetables, fruit, and sea vegetables. Also, there are valuable protective fats that lower the risk for getting breast cancer, including oils from fish, flax, borage, primrose, olive, and conjugated linoleic acid (CLA). The average American consumes about 132 pounds per year of refined white sugar. The late and highly respected Nobel laureate, Dr. Linus Pauling, felt that sugar was a greater risk toward cancer than fat. 2) normoglycemic (normal blood sugar) which would be generated by the meat, potatoes, bread, and ice cream diet. 3) hyperglycemic (higher blood sugar) which would be generated by the ribs, Pop Tarts, and Pepsi diet. There was a “dose-dependent response”. The lower the blood glucose, the longer the animals lived with breast cancer. Part 2 will be available in three weeks. ← What Do Vitamins Do For You?